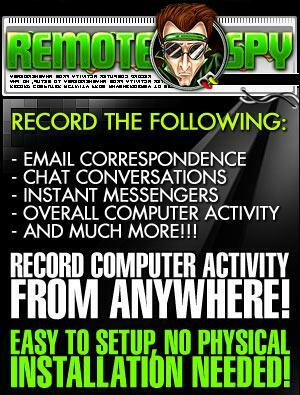 Remote Spy is the latest in high-tech PC surveillance software. Secretly Record all Computer and Internet activity on your own PC remotely with our powerful yet simple-to-use Spy Software. Remotely Install No Physical Access Needed! Deploy with a few Clicks via email, messenger, etc! Remotely Monitor ANY PC YOU OWN! Know how your PC is being used while away. Place A Secure Order - Get Instant Access!